Female Found throughout England, Wales and Scotland in open habitats, parkland, gardens and arable land. 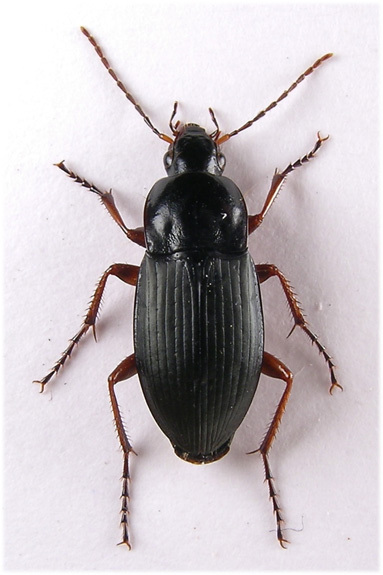 They are nocturnally active and can be very common where found; warm nights in June and July produce hundreds of specimens on pathways in parkland around Watford, often in company with large numbers of Nebria brevicollis (Fab.) 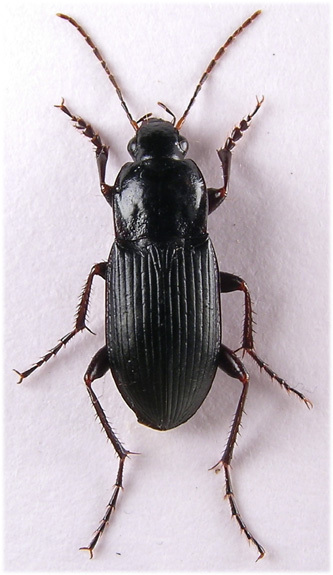 and Pterostichus madidus (Fab.). Baited pitfall traps in parkland shrub beds occasionally hold specimens, those in the open, especially near pathways may need to be re-sited due to large numbers of fuscipes. Brachypterus, moves fast when disturbed or illuminated by torchlight. Occasionally found in woodland. Autumn breeding, adults are found under bark or logs or in moss or dead vegetation in winter, usually singly or in pairs. 10-14mm. 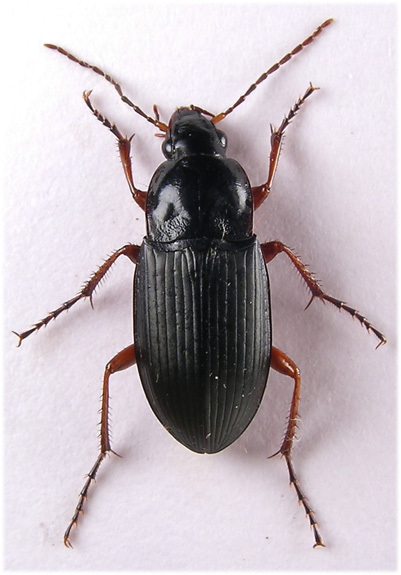 Unmetallic black with convex underside. Basal antennal segment(s) red ¹ and mouthparts dark red ¹, palpi long, apical segment almost cylindrical. Two setiferous punctures by inner margin of eye. 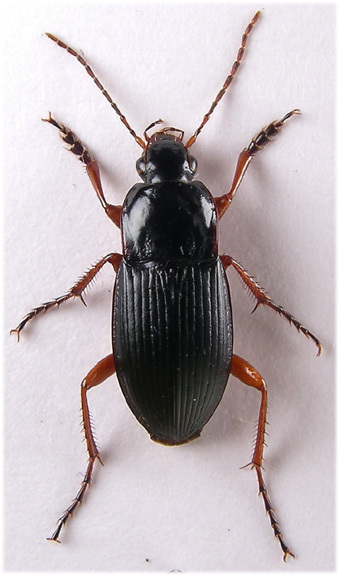 Legs long, black to almost completely red ¹ but apex of tarsal segments always dark. 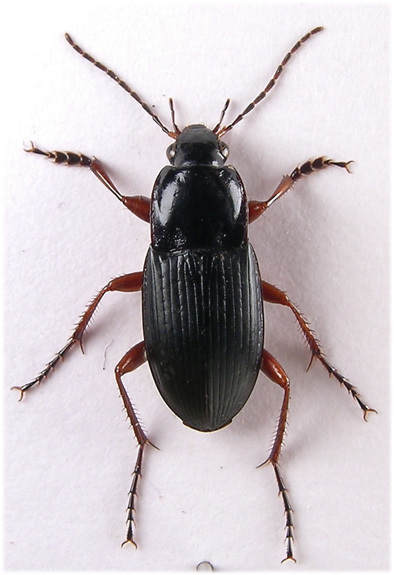 Tarsi, apart from a few long setae, glabrous above and claws serrate (X20). Pronotum elongate with well marked hind angles, strongly margined laterally and with central longitudinally impressed line. Basal fovea punctate. Head and pronotum strongly shining in contrast to the heavily microsculptured elytra which appear dull. Both the third and fifth ¹ elytral striae have a series of punctures attached, usually around 10 in number ². Epiplura not crossed. Male with basal protarsal segments dilated and elytra somewhat shining. 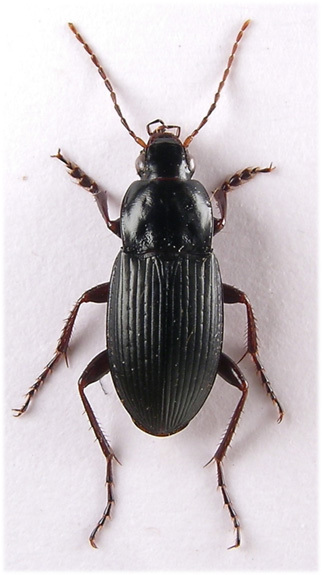 ¹ Calathus luctosus Lat., added to the British list by Luff, 1989 is similar but with antennae and legs entirely dark to black and lacking the fifth strial punctures. Dark appendaged specimens should be checked. 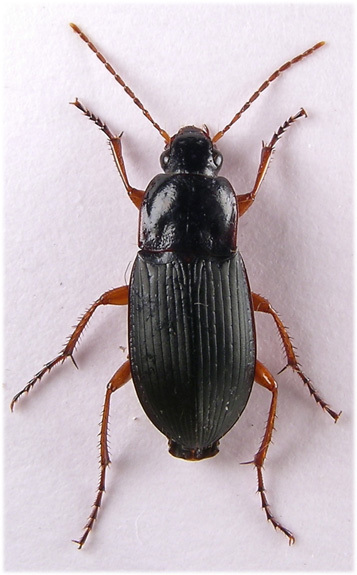 ² Two dark legged specimens ar known from Lincolnshire which lack punctures on the 5th stria and so will key to C.Luctosus, they are otherwise indistinguishable from fuscipes. Suspect species should be checked. (Luff).